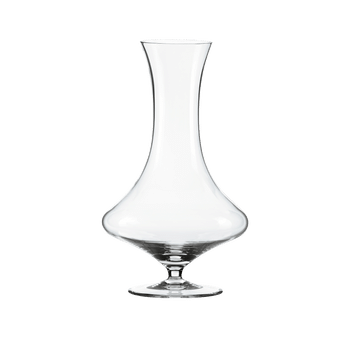 Home Shop RIEDEL Decanter Boa R.Q. The handmade decanter distinguishes by an elegant and complex design. RIEDEL celebrates the Year of the Snake. To commemorate the sign, which represents power, among other qualities, Maximilian J. RIEDEL, 11th-generation head of RIEDEL Crystal, designed the BOA decanter, the house’s most powerful decanter yet. The BOA, RIEDEL’s latest powerful “wine tool,” which advances “double-decanting” technology to accelerate the aeration of wine, features a more tightly-coiled body, which brings wines to full flavor profile potential when decanted even more quickly than other RIEDEL decanters. Since 2008, 11th-generation CEO and designer Maximilian J RIEDEL has taken inspiration from the Chinese Zodiac, channeling the centuries-old culture’s reverence of positive attributes of animals, reptiles, fish and mythical creatures into his award-winning functional decanter designs, including the Eve (2008), Mamba (2011) and Cobra Verde (2012). The attribution of 2013 as Year of the Water Snake augurs motivation, insight and reward for those born throughout the year, heralded by RIEDEL with the introduction of the BOA. RIEDEL’s latest powerful “wine tool,” features a more tightly-coiled body, which brings wines to full flavor profile potential when decanted even more quickly than other RIEDEL decanters. For the BOA, Maximilian took inspiration from his travels throughout North and South America, the native home of the boa constrictor Having moved from Austria to RIEDEL Crystal, Maximilian has spent over ten years building RIEDEL’s business in the Western Hemisphere, while also enjoying frequent travel to Brazil, Mexico, Argentina and more, where the creature is quite prevalent. To introduce the decanter, Maximilian developed the first-ever web-ready video, a cartoon detailing RIEDEL’s celebration of glassware’s many functional forms. RQ = this item is supplied as 'Restaurant Quality' meaning that it may contain small imperfections when compared to the same item in 'best quality' and, as such, is offered at a special purchase price exclusively for use in restaurants.